Shuravi is the innkeeper at the Three Sisters' Inn in Leyawiin. She sells food and beds and is the eldest of the "three sisters". Her younger sisters, Shamada and Shomara, serve as hostess and cook at the inn. Shuravi stands offering her services (food and drink) at the inn almost all the time, only taking a break to eat at eight at night for two hours. Around Leyawiin, you will hear rumors regarding Shuravi and the inn: "The Three Sisters Inn is a nice place, but that Shuravi sure is grumpy. I don't think she likes anyone." and "Shuravi runs a good inn, but she's awful with her sisters." Both rumors seem to be true. "Well, you've found the Three Sisters. Beds and food. Not cheap, but you get what you pay for." is her charming introduction, and she goes on to add, "I'm Shuravi, the sister-that-works-and-worries. Shamada is sweet and decorative. Shomara is dumb as a post. But she can cook, at least." The only time she brightens up is when talking about the room she has for rent. She offers it to you with, "I have just the thing for you. A lovely suite on the second floor, for only 40 gold a night. Quite a steal. Interested?" If you rent it out, she will add, "It's just up the stairs there. Second floor, the east wing. All the comforts of home." Shuravi's comments about town vary as the Fighters Guild questline plays out. At first she will tell you, "Blackwood Company is putting the Fighters Guild to shame. They're a new mercenary company, competing with the guild. Beast people and other savages. Work cheap and fast. 'No job too tough.' Not fussy, either. Fighters Guild better watch out..." After the Azani Blackheart quest, she starts to change her tune: "People are beginning to have second thoughts about the Blackwood Company after the Azani Blackheart hoax. Sounds like they were in it with Blackheart. As folks learn more about the Blackwood Company's methods, they aren't so eager to hire them." Once the quests are complete, she will ask, "Did you hear about the Blackwood Company? They were all mad murderers hopped up on hist? And crooked, thieving frauds? They're gone now. Fighters Guild took care of them. And about time the Guild showed some sand. They are 'fighters', aren't they?" 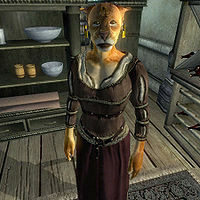 She also has a take on local politics: "It's a pretty town, and everyone is really friendly, except maybe some Khajiit and Argonians who are upset about the Trans-Niben. I think it's a shame how they took that land from Elsweyr, and Argonians are afraid it could happen to them, too." Shuravi wears a middle-class outfit consisting of a brown shirt, burgundy linens, and a pair of pigskin shoes. She also carries a moderate amount of gold. After closing the Oblivion gate outside the city during the Allies for Bruma quest, she will say, "The common folk of Leyawiin recognize your valor, even if Count Terentius does not." Count Terentius is the count of Bravil, not Leyawiin. This bug is fixed by version 3.0.1 of the Unofficial Oblivion Patch.